Iconic Cloth for Custom Clothing. Golf Legends of the ‘30’s and ‘40’s dressed in style. Trousers and plus fours were made from English doeskins that had an elegant drape, but were a tad on the heavy side. 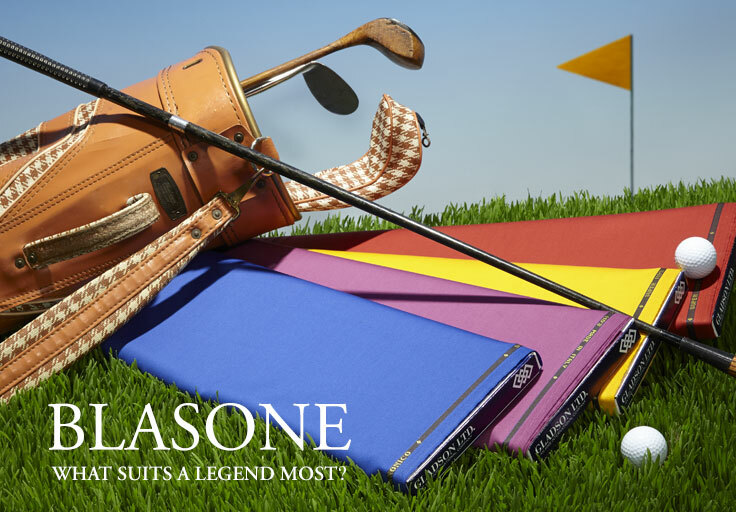 We are pleased to introduce an expanded selection of shades in our Blasone™ cloth. There are 32 colors in all, presenting many possibilities for augmenting a trouser wardrobe… trousers to co-ordinate with sport jackets and blazers as well as trousers that stand on their own when worn with elegant sport shirts or knitwear. Blasone™ has an inviting hand, without sacrificing wearability. It is a cloth that tailors enjoy working, and it is a cloth their customers keep coming back to because of its excellent performance. Blasone™ is woven in Biella, Italy from fine Super 110s Australian Merino Wool and is weighted for comfortable year round wear. Create your own legend with Blasone. Blasone is part of the Legend’s collection and is exclusive to HMS and may be purchased only from Gladson Ltd. and Huddersfield Fine Worsteds.